Germany is known as the Motor of Europe. The most economically properous country in the European Union with highest industrial production and highest export base. Germany is the place where the concepts originate. Of the world’s 500 largest stock-market-listed companies measured by revenue in 2010, the Fortune Global 500, 37 are headquartered in Germany. 30 Germany-based companies are included in the DAX, the German stock market index. Well-known global brands are Mercedes-Benz, BMW, SAP, Siemens, Volkswagen, Adidas, Audi, Allianz, Porsche, Bayer, Bosch, and Nivea.Germany is recognised for its specialised small and medium enterprises. Around 1,000 of these companies are global market leaders in their segment and are labelled hidden champions. Along with superior technological edge, Germany is also a country of highest quality intellectual tradition. It is the country where the concept of modern Universities has taken its root under the Humboldt Model. Laterwards, American Universities followed that model and became very successful. Germany’s achievements in the sciences have been significant, and research and development efforts form an integral part of the economy. The Nobel Prize has been awarded to 103 German laureates.For most of the 20th century, German laureates had more awards than those of any other nation, especially in the sciences (physics, chemistry, and physiology or medicine).Germany has been the home of many famous inventors and engineers, such as Johannes Gutenberg, credited with the invention of movable type printing in Europe; Hans Geiger, the creator of the Geiger counter; and Konrad Zuse, who built the first fully automatic digital computer. German inventors, engineers and industrialists such as Count Ferdinand von Zeppelin, Otto Lilienthal, Gottlieb Daimler, Rudolf Diesel, Hugo Junkers and Karl Benz helped shape modern automotive and air transportation technology. Aerospace engineer Wernher von Braun developed the first space rocket and later on was a prominent member of NASA and developed the Saturn V Moon rocket, which paved the way for the success of the US Apollo program. Heinrich Rudolf Hertz‘s work in the domain of electromagnetic radiation was pivotal to the development of modern telecommunication. Germany is one of the leading countries in developing and using green technologies. Companies specializing in green technology have an estimated turnover of €200 billion. Key sectors of Germany’s green technology industry are power generation, sustainable mobility, material efficiency, energy efficiency, waste management and recycling, and sustainable water management. German Univerisities are world renowned with world reputed Professors and researchers working in world class institutes like Fraunhofer Society and Max Planck Institute. Most of the cutting edge researches in Automotive (Daimler Benz, BMW, Volkswagen), Energy (ABB, Siemens), Sports Goods (Adidas, Puma), Insurance (Allianz), Clothing and Apparel (Hugo Boss, Escada), Information and Communication Technology (SAP, T-Mobile, Alcatel, Deutsche Telecom) are happening in Germany. This gives the students the necessary industrial exposure along with their normal study course. Germany is one of the favorite study destinations among South Asian students for higher education. There are more than 350 state and private universities offering a variety of undergraduate, postgraduate and doctoral programs. There are more than 250,000 foreign students currently studying in Germany, of which about 10,000 are South Asian. German universities have affordable tuition fees, which is one of the prime reasons to attract South Asian students in German universities. Though it is advisable to know a little German to sustain yourself in Germany, there are more than 500 International Degree Programmes which are taught in English and you need not be fluent in the German language. As part of the Bologna process the German higher education system is transformed to fit the Bachelor and Master structure by the year 2010. For English Language proficiency IELTS or TOEFL are required before the university confirms admission. The IELTS is organized by the British Council and results take 2-3 weeks. 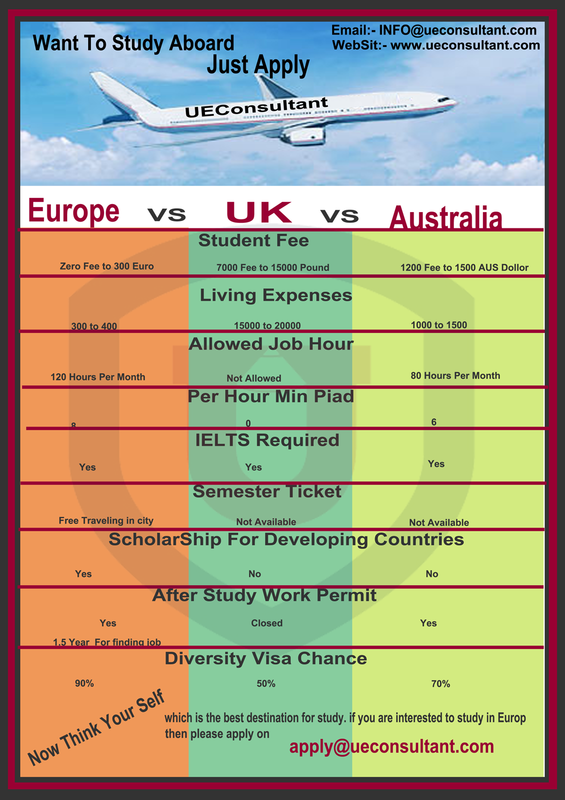 For international students, Education is free mean there is no tuition fee. There is semester ticket fee which is different in different cities. There are also private universities which take tuition fee and it’s easy to take admission there, but the cost for tuition is form €3,000 to €30,000 up to the course. reassesses literary entanglements and processes of canonization between Europe and the Middle East. the Middle East and in Europe. who want to carry out their research projects in connection with the Berlin program. As a rule, the fellowships start on 1 October 2013 and will end on 31 July 2014.
builds upon the previous work of the Working Group Modernity and Islam (1996-2006). Since 2011 EUME is continued at the Forum Transregionale Studien. Stiftung and is funded by the Senate of Berlin. For more information on the Forum please see www.forum-transregionale-studien.de.